How do I view leads from my website? Step 1) Login to your All-In-One website control panel. 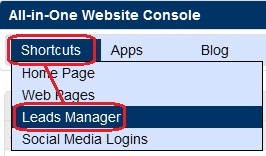 Step 2) Click on 'Shortcuts' on the top-left and then click on 'Leads Manager' from the sub-menu. Step 3) You should now see a list of leads from your website. Step 4) To add a lead manually, click on the down-pointing arrow next to 'Leads manager' and then click on 'New Lead' in the sub-menu. Step 5) Fill out the form as necessary and submit at the bottom of the page to finish adding a manual lead.